Are you dreaming of taking a trip to the tropics? Webjet offers Bali holiday packages and deals to help you experience a piece of paradise without spending a fortune. When you book holiday packages to Bali through Webjet, we bundle together your airfare and hotel or accommodation costs, helping you save big on your Bali holidays. Bali packages and deals make planning your trip easy and leave you with extra money to put toward everything you’ll be experiencing during the holiday. Are you interested in learning more about Webjet’s holiday packages to Bali? Keep reading to see why a Bali holiday package and travel deals could be the perfect option for your next trip. As one of the most popular international destinations for Australian travellers, there are lots of flights that will get you to Bali on your Bali package. Ngurah Rai Airport (DPS) is the major airport serving Bali. It’s located in Denpasar, Bali’s largest city, and offers affordable ways to get to the many towns around the island. Many airlines have daily routes between Australia and Bali, including Jetstar, Air Asia, Garuda Indonesia, Qantas, and Virgin Australia. Direct flights are available from almost all of Australia’s major airports—Melbourne, Sydney, Brisbane, Perth, Adelaide, Darwin, and Cairns. If you are travelling from another city, you can easily catch a flight with a quick stopover. No matter where you’re travelling from in Australia, you won’t have to spend much time on the plane before arriving. A flight from Melbourne, Sydney, or Brisbane averages at about 6 hours 30 minutes, a flight from Perth lasts around 3 hours 30 minutes, and a flight from Darwin is less than 3 hours. 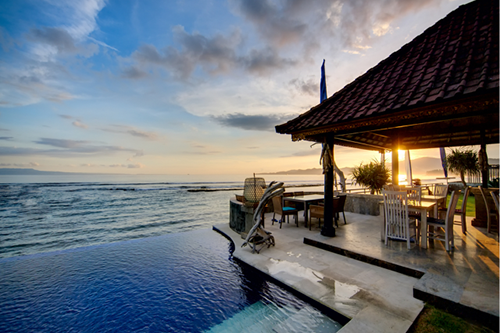 It is wise to organise a transfer from the airport directly with your Bali accommodation. Where can you stay with your Bali Holiday Package? Bali has a huge variety of hotels, resorts and accommodation, all available to be booked on Webjet Bali deals. And due to its affordable prices compared to the Australian dollar, you can get some really great bargains on your Bali accommodation. Even budget travellers can experience some luxury accommodation as part of the holiday packages. Located just steps from the beach, beach clubs, shopping, and lots of restaurants, Legion Beach Hotel is in a great spot for your Bali holidays. Within the hotel, you can enjoy a full service spa, two different swimming pools, and a tennis court. There are five restaurants on site and a shuttle that can take you to the local attractions. There are a variety of rooms and villas available, all of which are equipped with air conditioning and WiFi. Many of the rooms also offer a beautiful view of the hotel’s tropical gardens. The Garden Beach Resort is right in the heart of Kuta Beach. From the resort, you could easily walk to the beach or spend the day lounging by one of the three pools, one of which looks out over the ocean. Down on the beach, there’s an area reserved just for resort guests. The Garden Beach Resort has eight different restaurants, but due to its great location in Kuta, you’ll have lots of dining options outside of the resort as well. Each room has its own private balcony, and many have a gorgeous view of the beach and ocean for your Bali holidays. For the perfect inland experience with your Bali package, the Temuku Villas in Ubud are located right in the heart of a rice field. The resort is made up of eleven villas, each with its own private garden and pool. The villas offer luxury without a high price tag. The resort also has a spa where you can receive a variety of treatments while looking out over a rice field. Butler service and shuttles into the centre of town are available to villa guests. And if you’ll be staying at the Temuku Villas for more than three nights with your Bali holiday package, you can receive free transportation to and from the airport. For an extremely luxurious stay in Bali, the Alila Villas in Uluwatu are perfect. While the price is higher than most Balinese resorts, it is one of the most stunning places you could imagine for your Bali holidays. Located in Uluwatu, the villas are located on top of a cliff overlooking the ocean. Each villa has its own private pool and patio as well as butler service. The resort has a great spa and offers regular activities you can take part in, such as feasts of local food, yoga, and meditation. The Alila Villas are so relaxing and feel like they’re detached from the rest of the island, but popular spots such as Uluwatu Temple and Pandawa Beach are just a quick shuttle ride away. Bali is a beautiful island in Indonesia that is known for its beaches, rice fields, and elaborate temples. With such affordable prices compared to the Australian dollar, even budget-conscious travellers can get a taste of luxury on Bali holiday packages and deals. A popular way to get around Bali is by motorbike. Renting a motorbike for the day can be a great way to experience Bali like a local. However, if you don’t feel comfortable on the Balinese roads, you can hire a private driver for around $50 a day to take you to see some of the hot spots during your holiday packages to Bali. Private drivers are very knowledgeable about their island and will teach you many interesting things about the Balinese way of life and the places you visit. You can’t book Bali holiday packages and not spend some time lounging on the beach. Kuta Beach is a popular destination, but can also get quite crowded. Head a bit further up the coast to Seminyak where you can visit calmer beaches and some beach clubs. Bali beach clubs are right next to the beach, serve food and drinks, and often have an infinity pool overlooking the ocean. For a quiet and authentic beach experience on your Bali holidays, visit Canggu where you’ll get a mix of beaches and rice fields. With the Balinese people being very spiritual, there are many stunning temples to visit around Bali. Tanah Lot is a temple located in the ocean, and Uluwatu Temple is on top of a cliff and the perfect spot to watch a Balinese sunset. On the northern side of Bali, Pura Tirta Empul is a beautiful water temple where Balinese people go to meditate and wash away bad thoughts. While the Balinese beaches are amazing, for a truly authentic experience on your Bali holiday deals, head inland to the town of Ubud. Ubud is known as an artistic city and has a calmer way of life. Ubud is most well-known for its rice fields, the most popular being the Tegallalang Rice Terraces. There, you’ll see a shade of green more vibrant than anything you’ve seen before. The Ubud Monkey Sanctuary is another must-visit. The sanctuary is home to hundreds of monkeys, many of which are friendly and will eat fruit right from your hand. When you book holiday packages and deals to Bali, take some time to visit the nearby Gili Islands as well. You could visit the Gili Islands as a day trip, but if you have enough time, a few days is perfect. The Gilis are made up of three islands, each offering something a bit different. Gili Trawangan has lots going on, Gili Meno is very quiet and secluded, and Gili Air is a hybrid of the other two. The Gili Islands are known for their great snorkelling and beautiful sunsets over the mainland of Bali. The Gilis, like Bali, feel like a real tropical paradise. Being in the heart of the tropics, Bali has two seasons: wet and dry. The rainy season lasts from November to March and rains almost every day during this time. If you book a Bali holiday package at the beginning or end of the dry season, there won’t be quite so much rain, but it will be extremely humid. The best months to book holiday packages to Bali are between May and September. There will be crowds but, by avoiding the main tourist hotspots, you can still have a nice, relaxing trip. Although the humidity varies by season, the temperatures in Bali are pretty stable year-round.